For grass and beach volleyball rules, competition may consist of 2, 3, 4, or 6 player teams. All competitions must involve teams with the required number of players. Teams with less than the required number of players are incomplete and forfeit the set or match. The match is won by the team that wins 2 sets. In the case that the match comes to a 1 to 1 tie, the deciding set is played to 15 points, with a minimum 2 point lead. The first 2 sets are won by the team that scores 21 points first. In the case of a 20 to 20 tie, play is continued until one team has a 2 point advantage. Whenever a team fails in serving, fails to return the ball to the opponent, or commits any faults, the opposing team wins the rally. If the opponents served, they get a point and continue serving. If the opponents received the serve, they get a point and gain the right to serve next. The playing court is rectangle in shape and measures 16 X 8 meters (52 6 X 26 3). Court dimensions for indoor volleyball are different. Compared to an indoor volleyball court, a beach court is a meter narrower and 2 meters shorter in length. Beach volleyball rules for FIVB competition, the free zone surrounding the court should be a minimum of 5 meters to a maximum of 6 meters from the endlines and sidelines. There should be a minimum height of 12.5 meters (41 feet) of free space above the playing surface. The playing surface should be made up of leveled sand, as flat and uniform as possible. The sand should not contain anything that could cut or injure players such as rocks or shells. 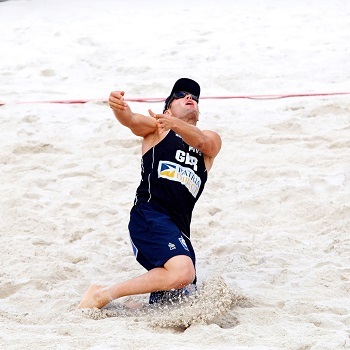 For FIVB competition, sand must be at least 40 cm deep and made up of fine, loosely compact grains. Courts should consist of grass surfaces that have been preserved free of puddles, holes, or uneven ground. The court is mark with 2 endlines and 2 sidelines. All lines are 5 to 8 cm wide (2 to 3.75 inches). The color of the lines must contrast sharply with the color of the sand. Lines should be made of a resistant material. If anchors are used, they should be made of soft flexible material. Attack lines are marked 3 meters (910) from the centerline to the attack line. The antenna is a flexible rod made of fiberglass or a similar material. The antenna is considered part of the net and sets the limit to the crossing space. The posts must be round and smooth. Posts must be placed an equal distance from each sideline to the post padding. Posts cant consist of any dangerous or obstructing devices. If anchors for guy lines are used, they must be driven flush, free of sharp edges or buried beneath the playing surface. The ball must be made of material more suitable for outdoor conditions since matches may be played when it is raining. The ball should be bright in color (white, orange, or yellow, etc.). The weight of the ball should be 9 to 10 ounces. The inside pressure of the ball should be 2.5 to 3.2 lb/sq inch. International competition must use homologated balls. Teams are limited to two participants. The roster is limited to 5 players, unless otherwise specified by the tournament director. The roster is limited to 6 players, unless otherwise specified by the tournament director. Coed or reverse coed teams must contain an equal number of players on each team, unless otherwise specified by the tournament director. Beach volleyball rules for coed and reverse coed, teams must contain at least one male and one female player, unless otherwise specified by the tournament director. Opposing teams need not contain equal numbers of males and females. Kenda S. Lenberg. 2006-2007: USA Volleyball Domestic Competition Regulations.